Q: Valtteri, you're impressive mate, you've even turned up with no car. How did you get pole with no car? Valtteri BOTTAS: I'm a good runner! Q: You're a very good runner. Also, I know your wife is here, so did she bring you some luck, because she doesn't come to too many races, so it's a special pole, your fourth career pole. To beat Lewis, we know how tough it is, so run us through your session tonight. Bottas: Yeah, of course family support is always nice first of all. Today things were really getting better and better for me in the practice session and also in the quali, I just managed to find time here and there and it was all under control, and I just felt very good in the car. The Q3, run one lap was really good and so that was enough for pole and so I'm really happy. Q: Sensational, mate, really good effort. Lewis, pretty handy lap from him wasn't it? Lewis HAMILTON: What a lap. He just had an incredible qualifying and congratulations to him. How you guys doing? You good? We have a great crowd here today. The last qualifying of the year, I gave it everything, but I seem to have lost a little pace going into qualifying, Valtteri did an exceptional job, so really, really happy for him. Q: Yeah, but it's easily done here to overcook the last Q3 lap isn't it? It's such a Mickey Mouse sort of track, so easy to overcook that rear tyre. We saw you run maybe a bit wide off the back of the straight right? Hamilton: Yeah, I think just overall it was just little bits here and there. I was up, I think, a tenth and a half out of Turn 1 and then I lost it in Turn 5 and 6. Either way it's been an incredible year of qualifying and one that I've really enjoyed and it's great to see so many British flags here, so many people here today, so I appreciate it. Q: Good job, mate. Sebastian, well done, mate. It was a bit of a Mercedes show tonight unfortunately. You're handy around here, but you couldn't fight enough for the pole position, right? Sebastian VETTEL: I was going to say: I'm getting better, you always had the edge here in qualifying. It think it was a good session. Obviously a bit of a shame to be that far back, but tomorrow we see, on race pace I think we can be a bit closer, but they have been very, very strong. Valtteri obviously had a mega lap, so congrats to him. We'll see. It should be a fun race. Overtaking is not always straightforward but not impossible here, so let's see. Q: Good luck, mate, I'm sure you can give them a good crack. We'll finish with Valtteri, we've got to convert this into a win haven't we. Run us through your emotions about how you're going to get the job done tomorrow and beat this legend that's had pretty big season? Bottas: Yeah, I was so gutted in Brazil, in the last race, being on pole and missing the win, so I have a clear target for tomorrow and I'm sure you guys will support me, so thank you. Q: Valtteri, pole number four, your first here in Abu Dhabi, two and a half seconds inside last year's pole time, and a great fight against your team-mate Lewis Hamilton. Two in a row as well, so tell us about your emotions. You were very excited after the pole in Brazil but I wonder after what happened after the start are you containing your emotions and saving them for this time tomorrow night? Bottas: Yeah, thank you, definitely a good feeling. It's only the fourth for me. It was just a really clean session for me, everything was really seamless. The team did a really good job on the timing, what time to be on the track, and we had to make very minimal changes during the qualifying to any settings really. I could just really focus on the driving itself and finding lap time here and there. I managed to get pretty much everything together in Q3, run one. It was a good lap. In the end that was enough for pole. I know the day is tomorrow and there is no point in getting too excited. Of course, you need to enjoy the good feeling, but it's only today and tomorrow is the day that counts. Q: Lewis, it's been a strong weekend so far, you've looked good in all conditions. You were nine one thousandths of a second up on Valtteri's time going into the final part of the lap. Was it that last exit of the corner where it got away from you? Tell us about that and also how you plan to turn it round tomorrow? Hamilton: First of all, congratulations to Valtteri, he did an exceptional job through qualifying and it's great to see to him performing at this level, particularly at the end of the season, which puts him in a great position for next year. For me, I was good through practice and P3 was great and then I made some changes in anticipation of the track cooling and in hindsight it probably wasn't the right one. But it was nice to experiment, which I hadn't really done all season long. I experimented and then I struggled a little bit with the balance generally through the laps. I think at the end I was a tenth and a half up out of Turn 1 and then I lost it somewhere else in the rest of the lap. Nonetheless it was fun to be out there challenging, the last qualifying of the year, finally it's done and we can just get on with the race tomorrow. It's a very hard track to overtake, there are a couple of opportunities but I'll give it everything I've got that's for sure. Vettel: Overall we tried everything. I think the balance of the car was good all weekend. We trimmed it in the right way. Practice this morning was a bit tricky but qualifying really came together, so I'm quite happy with that. The gap is big but also it's a long lap, so naturally the gaps are a bit more spread. I think in the race we usually get a little bit closer. Qualifying we've seen all year that we've never had the car to put half a second between us and somebody else. For the race I'm fairly optimistic. I think yesterday was good, we tried some stuff, so we'll see how close we get tomorrow. We touched on overtaking - it's not the easiest one but it's not impossible, so let's see what we can do. Q: (Flavio Vanetti - Corriere della Sera) Sebastian tomorrow in your mind you will have the attempt to try to win or the defence of the second place in the championship? Vettel: What do you think? I think we're here to race. Obviously it's important to seal second place. We are in a better position than Valtteri but he starts the race from a better position than we do. Let's see. It's a long race but we're here to race and the ambition obviously is to win, to get to the podium. We had a bit of a wobble finding our places, Lewis and myself, where's second, where's third here in the press conference, so it's always better to aim for the middle I guess. Q: (Graham Harris) Another one for Sebastian. Earlier this week you said you were determined to take Ferrari to the top - but it was hard. Just how hard do you think it's going to be? Is it going to be next year, or the year after? Vettel: Well, I don't know, we haven't achieved it yet. I think, as a team, we've taken some big changes. I think overall it's heading in the right direction. We have a very competitive car, we've had a very strong year. Obviously we would have liked it to be a bit different at the end but yeah, it doesn't matter now. We look forward. The year is more or less over, we have one more race and we want to finish with dignity. We want to show that we're here to fight and we want to get Ferrari on the podium and ideally win the race. Let's see what we can do - but overall it is hard, but everybody involved, you can ask the same question, they'll give you the same answer. I'm obviously one of the drivers that's driving the car, that's my main job but overall I think we're all seeking to improve and so far I think we've done pretty well. If we can do another big step like that, we're heading in the right way. Q: (Heikki Kulta - Turun Sanomat) Congratulations Valtteri. Did you need that killer instinct? Or how did you take that pole? Bottas: I think I didn't change my approach from last weekend in any way for the qualifying, and, like I said before, it was really clean, nice and clean session and I just managed to find time run by run from different corners. The car was feeling much better than at any other point this weekend. That allowed me to really work on the details. Found enough details to be on pole. Q: (Andrea Cremonesi - La Gazzetta dello Sport) Question for Sebastian and a question for Bottas. For Sebastian, it seemed like you lost a lot of time in sector two. There is something lacking in the speed? And for Valtteri, if I don't make a mistake, you won just once starting from the pole. How important after what happened in Interlagos will it be to start well tomorrow and then keep the position? Vettel: I think you're referring to the time-loss compared to the best overall time in sector two which - I don't know - maybe Valtteri or Lewis had? I mean, it's a long sector but there are a lot of straights. I think the corner bit we got it right, I was fighting a little bit throughout qualifying with the sequence of Five, Six, Seven, so I'm looking forward to get back and have a look. Overall I was pretty happy with the car around the lap, in particular, compared to previous years in sector two. But yeah, I saw as well that we're losing quite a bit of time, so I don't know. I guess it's probably on the straights but we need to see. 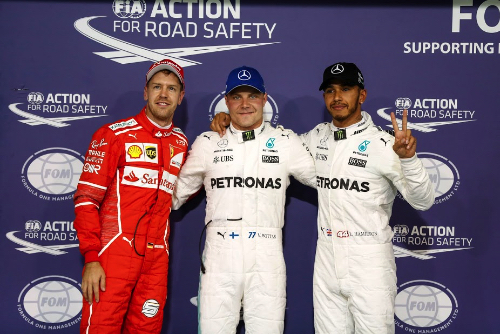 Bottas: Yeah, of course, when you start from the pole, the only target you have anyway... well, if you start from the front row or second row, you still have a realistic chance to fight for the win but pole is the best place to start and a win is obviously the only target. And yeah, I might have won only once from the pole but it's not so many poles I've had and yeah, so, I'm looking forwards to tomorrow, it should be interesting. Q: (Silvia Arias - Parabrisas) Congratulations Valtteri. You said two days ago that this track is not your favourite one - but do you like it now? A little bit more after this pole? And how much did you enjoy the lap? Bottas: Well, I never said I don't like it. I said for me it's average. Well, of course, it's always nicer when you have good memories from a circuit - like a pole position. But yeah, it's not real the point. The point is to be performing in every single track. So, that's going to be the goal in the future. Q: (Peter Windsor - F1 Racing) Lewis, Turns Two, Three and Four looked very impressive from the outside. I wonder if they now come under the heading of 'easy flat' or whether they are very demanding corners still and what they'll be like on a heavy fuel load. Interested to get your input on that. And secondly, your first qualifying lap in the Q3. Watching from the roof it looked like you braked slightly too late at the end of the straight and ran a little bit wide - but I don't know if that's an optical illusion from where we were watching, or not. Hamilton: It's not like Eau Rouge, where Eau Rouge is a lot straighter, more simple. It's still, Turn Two and Three, whilst it is flat, you feel that Turn Three is kind of... you feel the rear of the car moving a little bit. When you put heavy fuel on, it actually gets a little easier because you're just slower in general. So, the car is a lot better through there this year than it was last year, obviously - but they're still considered corners and they still put a huge amount of heat into the tyres, so you do take a lot of consideration when you enter them. And, you're talking about Turn 8 or 11. On the first one... I think that's the place where Valtteri was slower on the way in, quicker on the way out. I was... I'm always late on the brakes and brake as deep as I can into the corners. I think on at least one of the laps I had a small under-rotation into there. Nothing too crazy but it put a bit of understeer into the car. In general, yeah, it was a session of which I had to push a lot. P3 I was much more comfortable with the car, and then yeah, into this session it was not the case and it was like 'ah, I've got a serious fight on my hands here'. I gave it everything I could but it was on the knife-edge and ultimately Valtteri did the better job. Q: (Graham Cagyill - The National) Question for Sebastian. The last time you were in a championship season when you missed out on the title and you had a chance of winning it was 2009. When you missed out to Jenson and you came to Abu Dhabi for the first time, and you went on to win this race and went on to win the championship the following season - so I was just interested to find out how much that win in 2009 helped you in your confidence for 2010 - and do you think something similar tomorrow could help you for 2018? Vettel: Well, I'm a lot older than I was back then for a start. A lot wiser. I think, yeah, 2009 for myself was obviously the first time that I found myself in the front of the field, every now and then, and also for the team back then. I think yes, it did give us huge momentum for the year after, for the winter. I think the whole year gave us confidence. Then 2010. We had an incredible car and it was very close, to win the championship, I think we should have done better - but yeah, I had my mistakes, I think we have some here and there. Bu tin general I think the last race is important. Obviously if you're not in the fight for the championship, it still is important to set things up for the winter, just give a boost to the whole factory. So let's see what we do. I don't believe that the result tomorrow determines next year - but for sure a good result always helps you, gives everyone a boost over the winter, so we try our best.